You are currently browsing the category archive for the ‘Georgia General Assembly’ category. Pre-K Day at the Capitol Draws Crowd! Pre-K Day at the Capitol draws a crowd! 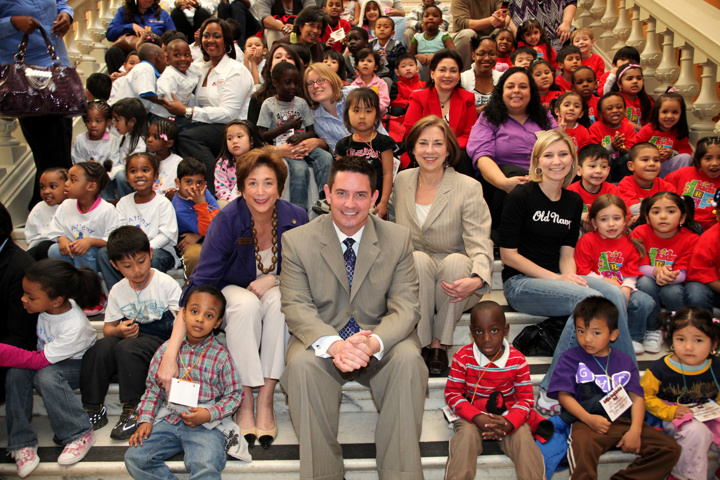 Left to right: Robin Ferst, president and founder of the Ferst Foundation; Bobby Cagle, DECAL commissioner; Pat Willis, Voices executive director; and teachers, parents and children from local Pre-K centers. A big thank you to all of our supporters. More pictures available on Flickr (feed below on blog) ! What is the proper role of diversion in cases of alleged child maltreatment? Earlier today, DHS Commissioner Clyde Reese presented the proposed 2012 DHS Budget to the House Appropriations Human Services Subcommittee. After the budget conversation concluded, Representative Penny Houston, who chairs the Subcommittee, asked Commissioner Reese to comment on the recent deaths of children in Georgia which had occurred within the last few weeks. Rep. Houston stated that as she understood the facts, a DFCS referral had been made in some of those cases. As part of his response, Commissioner Reese said that he wanted to “take a very hard look” at the practice of diversion. In cases of diversion, a decision is made to implement a short-term community-based DFCS response to an allegation of child maltreatment that’s not found to present evidence sufficient to cause concern. In such situations, the Department does not conduct any further assessment or intervention. According to the Commissioner, one concern is that once a case is diverted, there’s no further follow up on the part of the Department. He said that while the Department is to be commended for decreasing the number of Georgia’s children who are committed to the care of the state and also for making an effort to keep families together, he questioned whether “the pendulum has swung too far the other way”. More specifically, he posed the question about the proper role of diversion in situations were child maltreatment is alleged. It was a very honest conversation between two state leaders on an issue critical to the wellbeing and safety of children in our state. As the Commissioner and the Department look into this issue further, we’ll be watching to see what, if any, changes in practice and/or policy result. Since lottery programs were launched in 1993, HOPE was given wings; Georgia Pre-K was kept in a straight jacket. What should we expect for the future? Better yet, what should we demand? After 1993, the legislature expanded the HOPE program almost every year to cover more audiences and higher tuitions. The original target was new high school grads, then they added all graduates before 1993, a second chance for those whose grades fell below the required “B,” unlimited HOPE grants at the tech schools, special military scholarships, and home-schooled students. Private college scholarships were quadrupled, and the Board of Regents raised tuition regularly, assured it would be covered by HOPE. When lottery revenues were forecast to flatten out, the legislature tinkered with the definition of high school GPAs and course requirements and limited total college credit hours to try to control spending. Pre-K, on the other hand, was immobilized almost from the start. Our “universal” program actually limited the number of kids to be served. As many as 10,000 4-year-olds have waited for an opening. Qualified providers requested 13,070 additional slots in 2010; 11,000 were denied. Even more egregious, while tuition went up in colleges, we ignored the parallel increase in costs of Pre-K. “Tuition,” the per child reimbursement for Pre-K, has been essentially flat for 15 years! We required higher credentials for Pre-K teachers but we didn’t pay for them. Another audience in great need, much like those pre-1993 high school grads, were 3-year-olds, especially disadvantaged children. The legislature has ignored them. Neither unfettered funding for HOPE nor constricted funding for Pre-K will yield the results Georgia needs for education and economic success. Please, Governor Deal, limit the changes to lottery programs this year. We need an open discussion and a clear vision, informed by solid research and Georgia’s identifiable needs. We don’t need the pressure and politics of the legislative session to drive these decisions. Location, location, location: New home for public health? Earlier this week, State House Representative Mickey Channell introduced House Bill 214, legislation that would create a new and separate Department of Public Health. Currently, Public Health resides as a Division within the Department of Community Health. Two years ago, it was a Division within the Department of Human Services (then called the Department of Human Resources). In response to the dropping of this bill, in an interview with Georgia Public Broadcast, Governor Deal stated that he’s fine with the recommended change and referenced that services provided by the Division of Public Health are different from those of the Department of Community Health, whose main function involves running the Medicaid and PeachCare for Kids Programs. Within the past year, the Georgia Public Health Commission was created and charged with addressing the question of how and where Public Health should be structured. The work of the Commission culminated in December of last year with a recommendation that Public Health should operate as a separate state agency. Any thoughts in response to the recommended change? After years of transition, will Public Health finally have a home of its own?